Introduction: More than a millennium ago, when Hungarians were roaming on continental Europe, Vikings were roaming on the seas around the continent. Vikings were good sailors and tough warriors, and later on proved to be talented organizers of countries. There are several countries that were organised by Viking warriors, similarly to the steppe warriors who organised steppe countries. The countries founded by the Vikings can be found mostly around the North Sea and the Baltic Sea. These skilled warriors and seamen had a unique art. 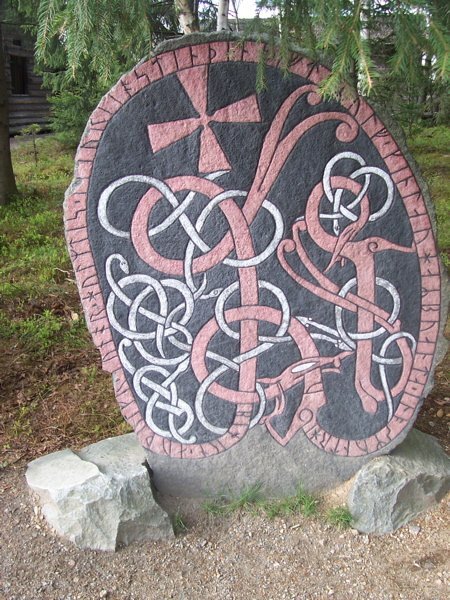 Probably the best known artifices of them are the tombstones with engraved drawings; most of them preserve writings with rune scripts and therefore they are called runastones. Especially the mythical drawings of the runastones from Gotland Island are outstanding. The people originating from this island were called by the name Goths, allied to Attila, the Hun King of the Carpathian Basin. In South Italy another state was founded by the Vikings, namely Sicily. The Hungarian King, Coloman I the Book‐lover, married the daughter of the Norman King of Sicily in the 12th century. Vikings sailed to the islands of Iceland and Greenland, and settled there, too. Later on they organized principalities on the Scottish Islands of Shetland and Orkney. Their art gradually developed during millennia into a characteristic Viking art from the arts of the northern people inhabiting the coastal areas of the North Sea and the Baltic Sea. Vikings are of north German stock; hence in their art they used several mythic elements of the German mythology. Arguably the most joyful of them is the Sigurd (Sigfrid) saga, especially the most popular scene when Sigurd stabs with his sword the dragon Fafnir.